The week of February 25 to March 1 marks Invasive Species Awareness Week. While invasive species may not come to mind while looking at your meowing cat or barking dog, it might if you think about “exotic pets” and the problems that may result if they are released into the wild. Whatever the reason, a pet should never be released into the wild. Releasing pet turtles, fish, birds, frogs, salamanders, or other pets is never a good idea. It’s not a better life for them in the wild because they often don’t know how to hunt or forage for food. Adapting to this new environment, which is often not their natural environment, is difficult. Many exotics released into the wild die quickly from car accidents or being caught by predators, while others die a slow death by starvation or exhaustion. In other cases, given the right circumstances, pets that are released may establish themselves in the environment. These exotic invaders compete for food resources with native species or become a new predator of these native species. Sometimes these exotics have no natural predators and quickly take over the ecosystem in which they have been released. Many people think of “exotics” as pets that are part of the illegal pet trade, such as Burmese pythons (invasive species in Florida that originated from Southeast Asia), red lion fish (invasive species in the Caribbean and Atlantic Ocean originally from the Indo-Pacific region), or squirrel monkeys (invasive species in Florida native to South America). But other seemingly “common pets,” when released, can also become a menace. Red-eared sliders compete with native turtles for food, and sites for nesting and basking. Goldfish disturb sediment and vegetation in pond, lake, and river bottoms, releasing nutrients that contribute to algae blooms that detrimentally affect the growth of aquatic plants needed by other species for food sources, habitat, and protection from predators. They also compete with young native fish species. Bullfrogs, while native in certain areas of North America, pose a threat to native frog species, both through predation and food competition, when released in non-native areas. The rose-necked parakeet has successfully colonized areas in Spain and other parts of Europe, displacing the native European bat, the greater noctule. The parakeets occupy the tree cavities once used by the bats for breeding and are aggressive with bats, often resulting in their death. “Exotics” can introduce various diseases to the native populations, causing irreparable harm. 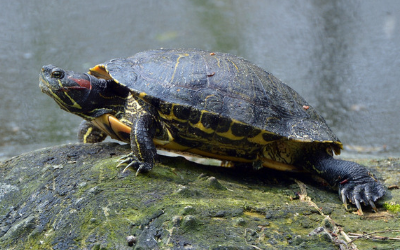 Red-eared sliders carry Salmonella bacteria that can be passed on to native turtles, and goldfish carry diseases such as koi herpesvirus that can affect native fish species. Whether you’re moving, your turtle has outgrown his aquarium, or you just can’t take care of your fish or bird anymore, never release your pet into the wild. Not only is it illegal, there are no good outcomes for your pet or your environment. Instead, find a rescue organization that will take your pet, contact your local humane society, or find an online forum for advice. Your veterinary clinic or pet store may also be a source of advice, and possibly even a solution. There are ways to rehome your pet, and rehoming – rather than releasing – is the only solution. Reach out and rehome!